If you have read Blue Chicken, then you know where my mind went next. Mr. Williams probably would not have approved. But I thank him anyway. Read the rest, about This House, Once, in my latest eNewsletter — here. From This House, Once, Atheneum Books for Young Readers, February 2017. The American Booksellers Foundation for Free Expression, ABFFE, will hold its Annual Children’s Book Art Silent Auction on Wednesday, May 29, at BookExpo America. This year's auction will include some special pieces created in memory of Maurice Sendak — and this is my tribute, above. You can learn more about ABFFE and this special event here. "As you probably noticed, I went away forever." It seems I decided by around age five that I wanted to be Maurice Sendak when I grew up. I penciled my name in right next to his on this book that he illustrated for Ruth Krauss in 1952, which is one of my most treasured possessions and has been with me always. Over the years I've become an obsessive collector of his work and words, which have taught me just about everything I need to know about writing and illustrating for children. I can think of no more to add to all that's been said about Sendak, or by Sendak, who died on May 8th at the age of 83. Dear Jennie, I did notice. And I will certainly look for you. Love, Debbie. Fresh Air Remembers Author Maurice Sendak, interviews with Terry Gross, including the last one in September 2011. Tell Them Anything You Want: A Portrait of Maurice Sendak, a documentary by Spike Jonze and Lance Bangs. Excerpted here. Art Spiegelman Discusses Maurice Sendak, with a comic strip collaboration between Spiegelman and Sendak. *As shared by Lynn Caponera, Sendak's assistant and longtime friend, who perfectly closed a memorial service for him at the Metropolitan Museum of Art last week by quoting this letter and sharing this image of his beloved dog, Jennie, "from his favorite book", Higglety Pigglety Pop! Or There Must Be More to Life. "... I became conscious that I was being haunted by a strange genius... Where he came from I cannot tell. At some time in his existence he must have wandered long in Alice's Wonderland... He was sincerity itself, and he had the simplicity of a child combined with the wisdom of old father William. No mortal could compare with him for ingenuity and inventiveness. He could do wonderful things with a piece of knotted string. There was one thing he lacked and that was a sense of humour; perhaps this was not a loss, for strangely enough it made him all the more humorous. It seemed wrong, however, to laugh at one so earnest, so guileless and free from cynicism, but at times he was irresistible. Fortunately, he was far too busy to care whether I laughed or not." Visit SurLaLune Fairy Tales to see more illustrations by W. Heath Robinson. You'll get my Letter by The seventeenth; Reply Or better, be with me - Yours, Fly. Suggested Reading, Picture Books about Emily Dickinson: Emily, by Michael Bedard, illustrated by Barbara Cooney; Emily Dickinson’s Letters to the World, by Jeanette Winter; The Mouse of Amherst, by Elizabeth Spires, illustrated by Claire Nivola; My Letter to the World, and Other Poems, illustrated by Isabelle Arsenault; Poetry for Young People: Emily Dickinson, edited by Frances Schoonmaker Bolin, illustrated by Chi Chung; My Uncle Emily, by Jane Yolen, illustrated by Nancy Carpenter. Sybil said leave tomorrow; Petra is going in July. Daniel wants to take the dog! How come Benito doesn't go? Did Dirk also send you this? Why did Walter show up... How is Eric doing? Is Jerold leaving him? How come Shirley is acting that way? Hey. Can you please contact me? "The Junkies", Part I, is here; Part II is here; Part III is here. Visit my post from last week for ways to celebrate National Poetry Month. Dadaism, I can't even start to think... No dance is innuendo, unkempt, A talk at elusive edge, To fit no faultfinding. I explain a galaxy tugboat Or teach a capable, inaudible, Breadfruit some creek and blunder, Veritable, the congenital moon. "The Junkies", Part I, is here; Part II is here. 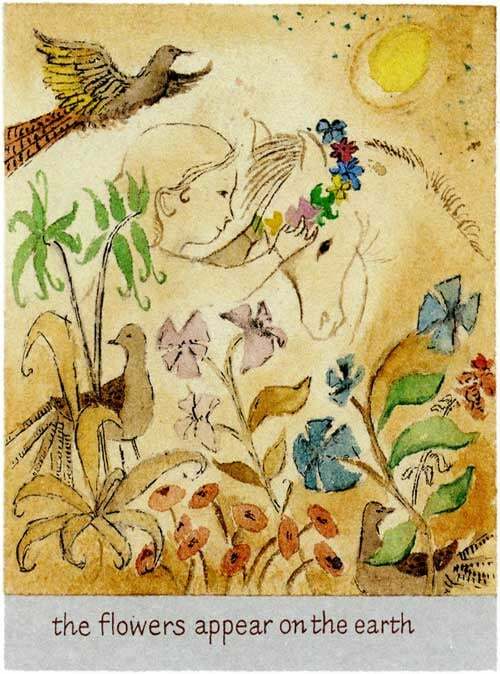 Illustration by Maurice Sendak, from Charlotte and The White Horse by Ruth Krauss. More Reading Suggestions, in honor of the coming spring: Spring Is Here by Taro Gomi; Fletcher and the Springtime Blossomsby Julia Rawlinson and Tiphanie Beeke; The Odd Eggby Emily Gravett; Rain Makes Applesauceby Julian Scheer and Marvin Bileck; The Story of Frog Belly Rat Boneby Timothy B. Ering. I shall always share these quotes with you, To explain my barely overdone Digression, pronounceable. Do cough by quarters; Go listen by pathology; Listen to the animals, and start as livestock. Watch this lyricism, A murmurous lullaby, rolled, But by my caution - candyfloss. "The Junkies", Part I, is here. From the International Reading Association, lesson plans on "Composing and Performing Found Poetry". Jumpin' Jive! Listen to Cab Calloway and watch the truly amazing Nicholas Brothers (don't miss them from 1:32 to the end) in Stormy Weather, 1943. Happy Hibernation and Holidays to all! Today's Reading Suggestion: A Seasonal Read-Aloud List, from "Write Up Our Alley". And more Emily Dickinson.